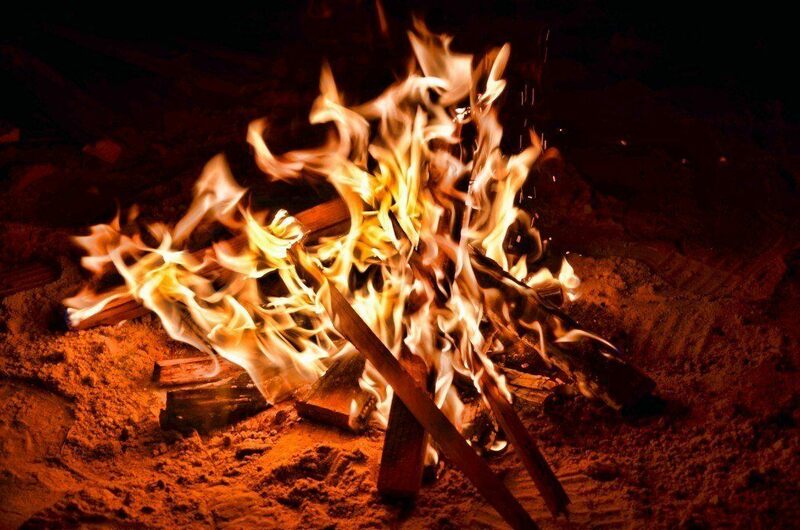 Are you burning up? One of the most annoying symptoms many women experience on the perimenopausal/menopausal journey is hot flushes/ hot flashes or the night-time version, night sweats. Just how do you deal with hot flushes? Some have an occasional one. Some dream of a time when they weren’t constant! And for some, flushes hang around long after menopause is over. But for most of us they can be managed and they will go away eventually. I rarely have hot flushes or night sweats, being postmenopausal, and I didn’t really experience them during perimenopause years either. When I get one, I usually know the trigger – sugar or alcohol for me. I believe the way I live now, and my diet, have really helped manage my flushes. I was on a low dose of HRT for about seven years because of early menopause at 41, to protect my bones and heart. But I came off it at ‘normal’ menopause age of 51 and managed my menopause-related symptoms, including hot flushes, naturally, both before I went on HRT, while I was on it and since coming off. Menopause is still a massive taboo, although becoming less so. But the more we talk about it, the less of an issue it is. I want women to feel empowered and informed to take control of their menopause experience. That includes how we deal with hot flushes/flashes and night sweats. 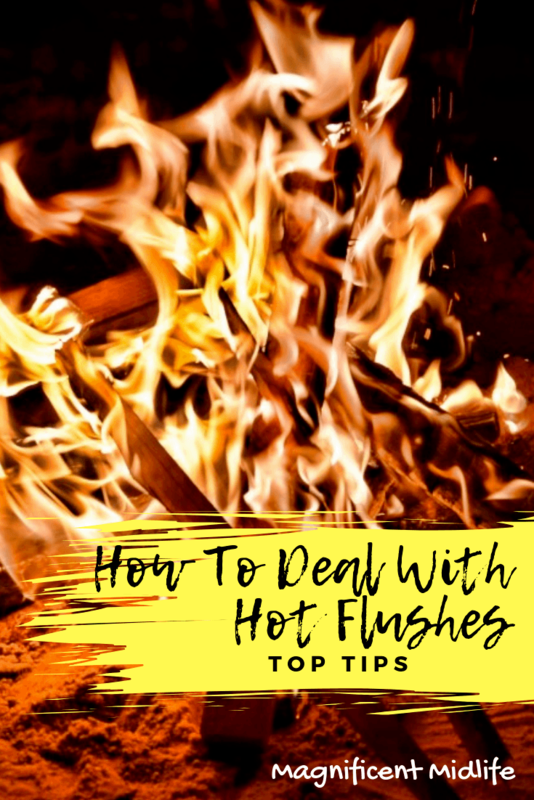 Here are my top tips for how to deal with hot flushes (flashes)! Think of them as power surges! If you think of them like that, rather than seeing them as a problem or something shameful, they become less of an issue. They’re great when it’s chilly! This may sound simplistic and naïve, especially if you’re coping with being drenched in sweat, but it’s worth a go. Mindset can be very powerful. A BBC documentary on menopause found that when women used CBT techniques to lesson feelings of shame around hot flushes, their hot flushes became fewer and less intense. Keep a diary of when you have hot flushes and the triggers for them. Is stress bringing them on? Caffeine? Sugar? Or alcohol? All these are known to exacerbate hot flushes. If you know the triggers, you can tackle the symptoms. Start with trying to lower your stress or improve how you deal with it. Hot flushes are exacerbated by stress. If you’re able to manage your stress, you may also be able to manage your hot flushes. Reduce levels of stress in your life, maybe adopt a meditation practice or do some restorative yoga. Both of these will help you lower stress levels overall and potentially reduce hot flushes. Try avoiding or reducing caffeine. For many women caffeine brings on a hot flush. Personally I haven’t had any caffeine since I went through early menopause at 41 which is over a decade ago. I was advised by Dr Marilyn Glenville to give up caffeine and I haven’t missed it in years. I love not being dependent on caffeine to get myself going in the morning or after lunch. Cut back on sugar especially refined. I was also advised by Dr Glenville to give up sugar or at least reduce my consumption of it. Refined sugar products, in particular, are known to cause hot flushes. I try not to overdo it on the sugar front but I do love my chocolate. The mini hot flush I occasionally get after I’ve had some chocolate is worth it. It’s just my little power surge! Evaluate how you live and what to change. I believe menopause is nature’s way of getting us sorted for a healthy second half of life. 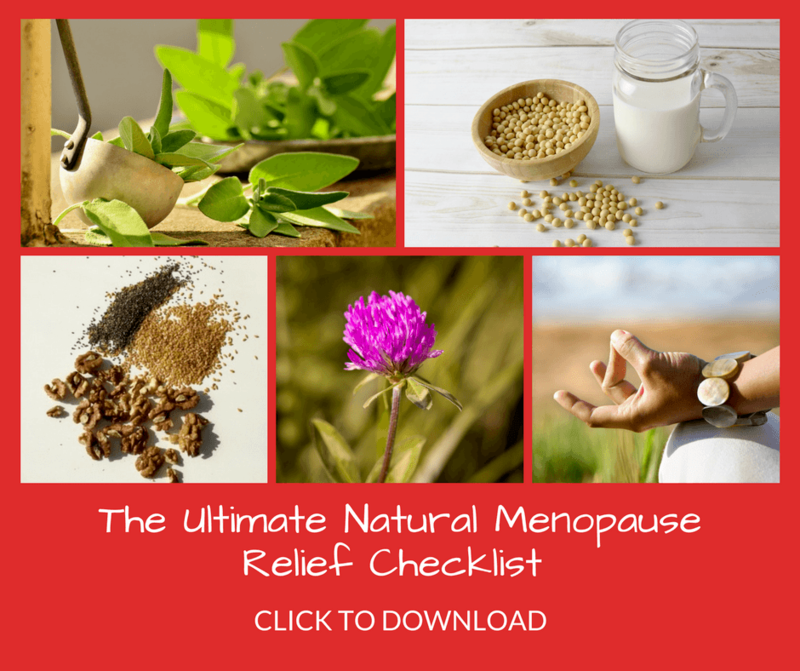 Rather than it being menopause that causes the problems (it gets a really bad rap! ), I see it as prompting us to re-evaluate how we live and what won’t work long term. We may have been able to abuse our bodies when younger. But if we carry on the same, we’ll run into problems as we age. Menopause is when our bodies say, enough’s enough with the unhealthy living! Or at least, be aware of the consequences if you choose to turn a deaf ear. Get a handle on your weight, if you think it’s an issue. If you’re significantly overweight in midlife, that will cause problems down the line. And women who are overweight are known to have more of an issue with hot flushes. Yes, you can take a supplement or HRT or try other things below that will help. But if you are, hand on heart, overweight and suffering hot flushes, consider trying to do something about it rather than just accepting it as a natural aspect of getting older. It’s not. Up your exercise. As we age we need more exercise not less and many women swear by exercise to help them manage menopause symptoms including hot flushes/flashes. I know regular yoga and running certainly help me. If you find alcohol a trigger for hot flushes, consider reducing your intake of that also. Unfortunately it’s many of the things we love that contribute to our power surges. But you may consider it a price worth paying. That’s up to you. But better to be informed so you can make that decision. Again, remember it may be your body telling you what you’ve done in the past, may not be what you need for long term future health. Bummer! Learn to regulate your temperature with ease. Wear layers and if you’re a fan of polo necks and sweaters, consider alternatives. I’ve given up wearing polo necks because I don’t want to run the risk of being caught having a hot flush and then being unable to do anything about it! Instead I’ve become a committed wearer of scarves and I regulate my temperature by just taking them on and off. Similarly, although they may not be the most sophisticated item of clothing, I’m a big fan of the humble cardigan. I can wear a cardigan, jacket, or zip-up fleece either open or closed. Unfortunately the same cannot be said for a sweater. So I think about the environment in which I’ll be wearing a sweater and whether I’d be comfortable taking it off! Avoid synthetic fibers and carry a pocket foldout fan especially in summer. I’m also usually to be found with a hair band on my wrist. I have long hair and my hair band helps regulate my temperature. I actually really feel the cold and can’t imagine ever having my hair cut short now. I would just be too chilly! Put being able to put it up in summer (or if flushing) is fab. Consider other dietary changes. Now’s the time to make your diet healthier and include lots of fresh vegetables. I was also advised to increase my intake of natural phytoestrogens which are thought to help replace the oestrogen lost by the body during perimenopause. This may help explain why women from cultures that eat foodstuffs with a higher level of natural phytoestrogens, experience fewer menopause symptoms, such as Japan. I gave up dairy milk and replaced it with organic soya, and have not had any dairy milk for over a decade. (Except of course when I’m at my mum’s and she doesn’t have an alternative, I will have a splash in my tea!). As well as soya milk, I also consume soya products such as tofu and miso – I try to keep these as unrefined as possible – highly refined soya products are not good for you. I also have ground flax-seeds on my cereal and I’m addicted to hummus. All of these are good sources of natural phytoestrogens and I’m convinced they’ve helped me transition more easily through menopause. Drink plenty of water and check whether spicy food brings on a flush. If so, consider avoiding that curry or decide it’s a price worth paying! Spirulina and maca powders, added to smoothies for example, may also help reduce hot flushes. So there you have it. My top tips for how to deal with hot flushes (flashes) and night sweats. There are many things to try and often it’s a process of elimination to work out what’s causing them in the first place. For most women, they will eventually go away post menopause. If they stay, it may be because there’s something else going on, which should definitely be explored with a medical practitioner. If you’re really suffering with hot flushes you should certainly consult your doctor. You should not have to suffer and HRT may be exactly what you need. If you have anything else to add that has helped manage your hot flushes/flashes and night sweats, please let me know in the comments below.